I was a member of the White Plains Y for 20-30 years and I had never used any other facility. Recently their pools broke down and I needed a place to swim. I went to the Greenburgh pool in White Plains, but they were under maintenance at that time. I then went to the YWCA only to find out their membership isn’t reciprocal, so I finally made my way to the Rye YMCA. 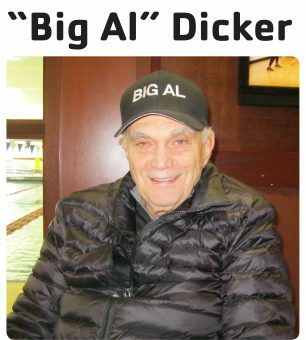 I got the name “Big Al” when I was coaching my son’s basketball team, as most athletes have nicknames. I have since carried that name and have worn it proudly in big letters across the front of my hat. I have even made large crowds laugh with my yoga pants that say “Big Al” across the back. As I have trained extensively in yoga, my goal is to bring positive intention wherever I go and into every activity I do, and I see that reflected here at the Rye Y. I am always greeted warmly by name and it feels really good. Everyone is helpful, and that matches up with my personal goals. I am the founder of Dicker Reading Method Reading Tutoring Center in Scarsdale where children improve 3-6 reading grade levels in just one year and I am trying to help the community, just like the Y does. I have made a lot of acquaintances here at the Y when I come in for my swim, and I’m glad that staff and members know me. I am happy that the name “Big Al” brings a smile to everyone’s faces. And I have to say – the water temperature in Brookside is much better than other Y’s! © Rye YMCA. All Rights Reserved. Site by Stark.